I'd really miss having a fuzz and delay though. If I can't use the Fender Reverb Unit, then I'd go with my Fulltone Octafuzz. This is my setup for the band anyway so I'm not missing much. That's easy it's what I have! 1965 Reissue Jazzmaster in Firemist Silver, 1973 Traynor YGM-3 amp with upgraded Celestian which is pretty much a Deluxe Reverb with EL84s. Pedal is a Joyo Vintage Overdrive - a truly decent tubescreamer clone with the best chip and the bass cut fixed for £25 new! Edit - if I could get either of my refin 65 spaghetti logo Tele's back I'd let my JM go. 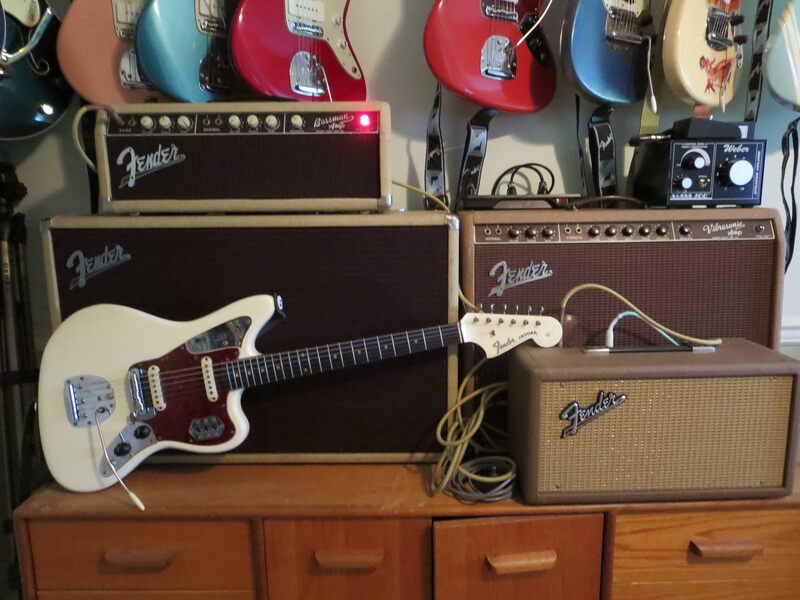 Ditto my old 65 candy red jaguar. One of the Tele's and the Jag resurfaced on eBay a couple of years back and it was torture! The Tele is just the best playing and sounding guitar I've ever held and it oozes inspiration whenever I pick it up. The Rusty Box is a fantastic overdrive, EQ, and preamp and has allowed me to get a fantastic sound even out of the worst amps. My old Princeton Reverb is just a lovely, lovely amp that is loud and lightweight enough to handle just about any situation I would find myself in. The Rustybox is based on an old Traynor bass preamp? I believe so, yeah. It does the Albini thing, but I'm not going for those sounds. I dial it up with the treble knob low, bass to taste (depends on the amp), and the midrange quite high for a Tweedy breakup sound. Right now it would be my Jarman Musguar into my Orange TH30. No pedals required.